The ability to cook a wide variety of foods that have an unbeatable taste, including steaks, chicken, pork, turkey, fish, pizzas, and vegetables. The highest quality grill and smoker made with our super ceramics and in our manufacturing facility overseen daily by our founder and business leaders. 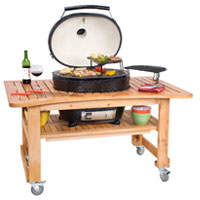 A Primo commitment backed by a 20 year warranty and the only ceramic grill proudly made in the USA. 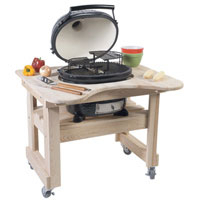 He patented Primo Oval XL features up to 680 square inches of standard cooking surface! Other features include a cast iron chimney cap, easy to read thermometer, reversible cooking grates, stainless steel lower vent door and ceramic shoes. 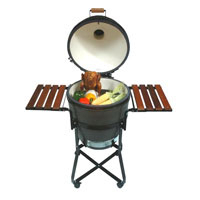 The Kamado features 280 square inches of standard cooking surface! Other features include a cast iron chimney cap, easy to read thermometer, reversible cooking grates,stainless steel lower vent door and ceramic shoes.